Toddlers are made to move, even younger toddlers (or “tabies” as they’re sometimes called). Our LG has been trying desperately to act like an older toddler since right around her first birthday, but so many “toddler” toys, especially gross motor toys, are beyond her current abilities. As a Montessori-inspired parent I believe in following the child. LG absolutely loves gross motor activities, so I knew I needed to help her cultivate this interest and provide her with safe, appropriate materials. 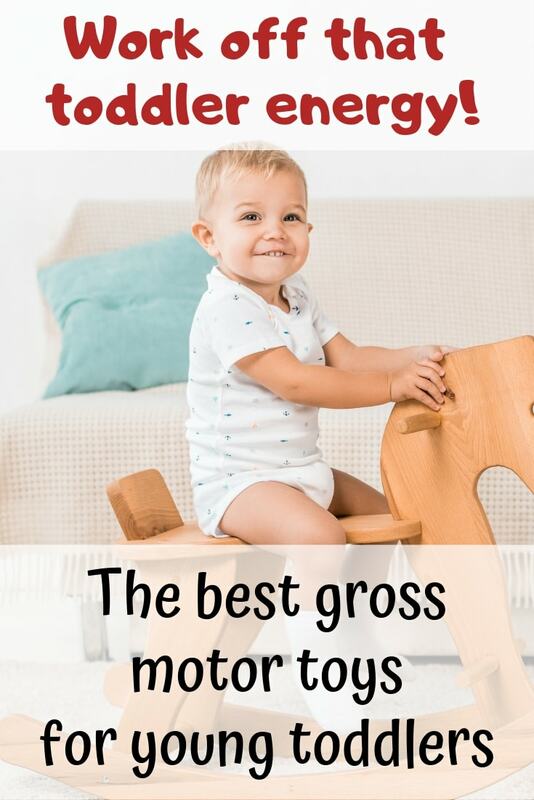 I dug around to find the best gross motor toys for young toddlers and I’m sharing the results of my research with you today. These toys are perfect for working out that toddler energy when you have a young toddler who just can’t stop moving! Gross sounds kind of icky! So what are gross motor skills for toddlers and why are they important? Gross motor skills are large movements that involve the bigger muscles of the legs, arms and torso. Your gross motor skills allow you to do everyday things like stand, walk, dress yourself, and go up stairs. Gross motor skills are related to other skills and abilities, including reaction time, proprioception (bodily awareness), physical strength, balance, and coordination. 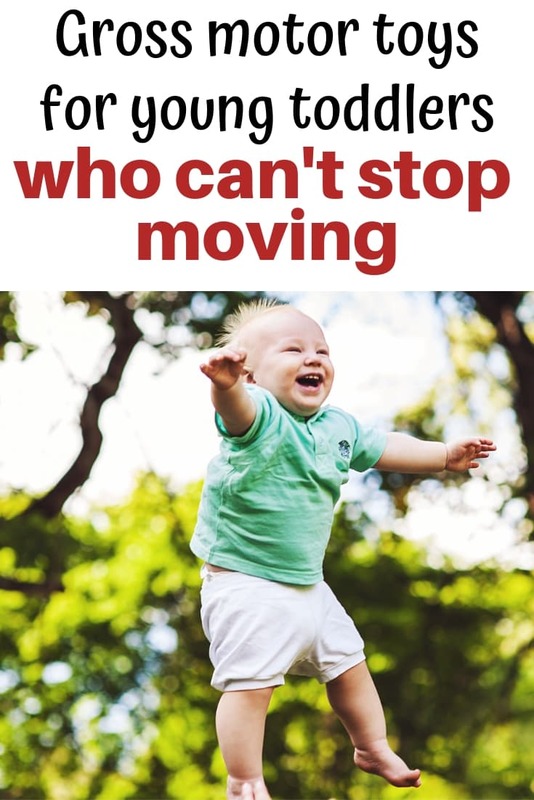 Because gross motor skills are so essential in life, it’s important to encourage gross motor skill development and watch for any gross motor delays. If you have concerns about your child’s development, make sure to talk to their healthcare provider! All children develop at different rates, but there are generally established ‘normal’ timeframes for gross motor milestones. There’s a comprehensive milestone chart from the CDC and you can look at for lots of information! Gross motor toys for indoors and outdoors can help your young toddler hone their skills and stay on track! They need plenty of opportunities to practice over and over again to really get these important skills down pat. When selecting a gross motor toy for your toddler, it’s always important to consider his or her current interests and abilities. Other than being on the lookout for small parts that might be choking hazards, it doesn’t really matter if the toy says it’s for older (or younger!) children if it’s what your child is into now. They seem so basic, but classic large, soft balls are fantastic gross motor toys! 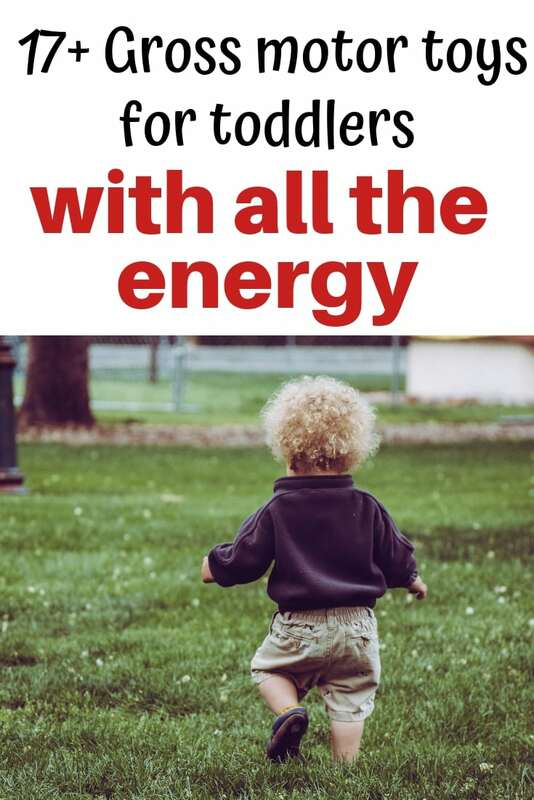 Young toddlers can work on picking them up, walking with them, and begin to start kicking them, too. LG always gravitates towards large balls when they’re around and passing a ball back and forth with other toddlers has helped her start to learn the concept of sharing!  BEST VALUE - Why pay extra for separate playground ball when you can get this most popular 4 colorful balls in 1 playset deal today? One of our LG’s favorite gross motor toys is this set of ‘stepping stones.‘ She got them as a first birthday present and, honestly, they were a it tricky for her to use at first. By 14 months she started using support from a wall or furniture to climb on top, then within a few days she was able to step up and balance on top without any help! Stepping up and down is her current favorite activity, but ‘stones’ like these can be used for years. I’m sure she’ll be trying to step from stone to stone soon! LG also loves picking the stones up and carrying them around, which is more good gross motor practice, even if it’s not what they’re “supposed” to be for. I’m happy to see LG working on stepping up and down because it will help her navigate stairs safely and walk in/out of the house when we go out to play! One of the things I like about our stones is that they have a rubber gasket all the way around the bottom. This helps them stay in place instead of slipping away and causing bonks! I noticed that some of the other brands just have little rubber dots instead of a full gasket, so make sure to look for stepping stones with a full rubber ring. Encourage kids to imagine they're stepping across a river of water - or even lava! There are several brands and sizes of this type of toy. Gonge is the big brand name. The Gonge Riverstones come in a set with different sizes, including some smaller ones that are easier for younger toddlers to climb on. They also make some epic looking hilltops to add on later for even more challenging climbing! On a recent trip to Atlanta, we stopped by this awesome place called HippoHop. They have inflatables, balls, playhouses, and foam play structures for children and toddlers. LG loved it so much! One of her favorite things was a foam tunnel like this one. It was up to make a U shape and she just climbed in and out over and over again. A foam tunnel can be used as a chair, tunnel, table, and more, so it’s a great toy that your toddler can use for years to come! The Nugget from Nugget Comfort has been on our wishlist for a few months now. My husband is starting full time work again soon, so hopefully we’ll be able to afford one soon (he wasn’t working for about 8 months after leaving active duty). 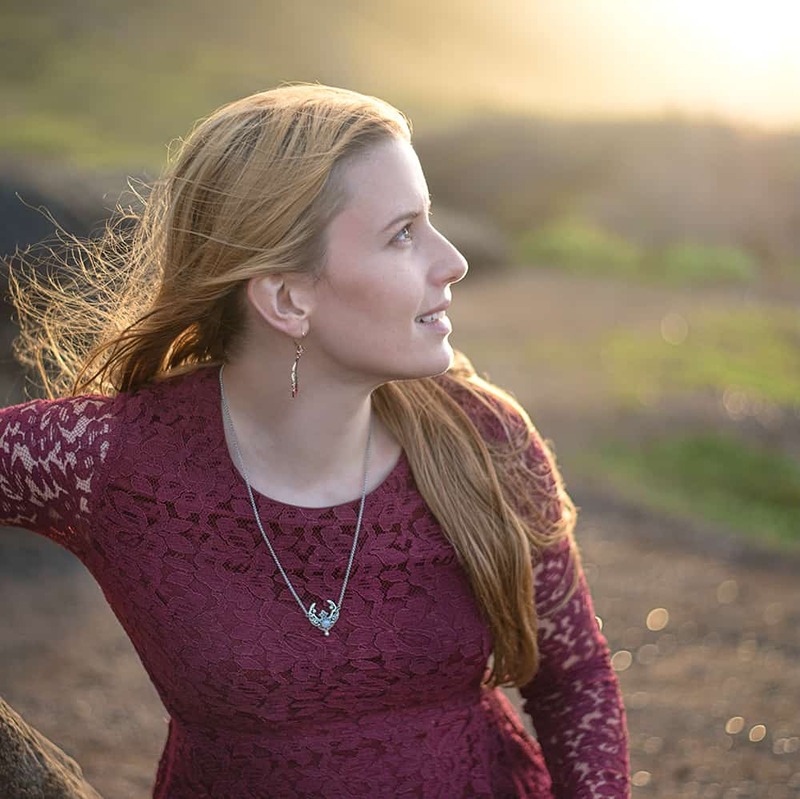 The Nugget looks so amazing and versatile, plus it comes highly recommended by people I trust! I am not an affiliate, so “serious” bloggers would probably tell me not to link to their site since there’s nothing in it for me. I can’t help myself, though – it’s such a cool product and made by a small, fairly local to me company. Update: We don’t have any blog-friendly photos yet (I don’t post pictures of my daughter’s face online), but we have a Nugget now!! It’s amazing and one of her absolute favorite things. We ordered an in-stock color and expected it to take up to two weeks to ship. It shipped the next day and arrived the day after! We’re super excited to order the Gonge River Set soon! We want LG to have a ‘balance beam,’ but all the soft ones are really long. Again, a floor balance beam is something she’s been able to play with elsewhere (so I know they’re a hit! ), we just don’t have one at home yet. You can just put a 2×4 down, but we don’t want it to scratch the floor. The River looks like the perfect choice! Young toddlers can practice walking a balance beam while holding your hand, but they’re also great practice for stepping up and down. Made of durable plastic with anti-slip rubber edges. Of course you can’t forget about the classic rocking horse! They’re great for working off energy and providing vestibular input, plus there are so many to choose from. I personally prefer wood toys whenever possible, but the Little Tikes rocking horse is durable and easy to clean. It’s a particularly good choice if you have multiple kids since it can withstand a lot of use! It also has a high-backed seat which means fewer tumbles and bonks for younger toddlers. Pop-up tunnels are really popular with toddlers and young kids. I don’t really have a favorite to specifically recommend, but I recommend looking for one without doors or flaps on the end. Yes, those caterpillar faces are cute, but in my experience the doors kind of get in the way and confuse, or even scare, younger toddlers, plus they can rip off with wear. I’d be remiss if I didn’t mention the Moluk Bilibo, a favorite open-ended toy for many toddlers and children. Honestly, our LG isn’t a huge fan, but I know it’s incredibly popular with many other children. You can spin, slide, and scoot in the Bilibo, or get creative and use it as a boat, shovel, etc. I don’s really fit in the Bilibo, but I have sat on one and spun around. It seemed pretty sturdy and fun to me – it just depends on what your kid is into! Great for use in playrooms or classrooms. Vinyl cover is durable, stain resistant easy to clean with a damp cloth and soap. This 5 piece foam set offers even more options for climbing, crawling, and working out that crazy toddler energy! Although it’s technically not a toy, a learning tower can be a helpful tool for toddlers. A learning tower is a child-safe step stool that allows your toddler to work alongside you in the kitchen, play with water in the sink, stand at the bathroom counter while brushing their teeth, and generally feel a part of your activities. The Step2Play slide is a fun choice for toddlers but it requires supervision because, honestly, the sides at the top are a bit too short for my comfort! That’s okay, though, because LG is obsessed with climbing up slides so I have to watch her constantly, anyway. Ride on top toys, beginner bikes, and balance bikes can work well for young toddlers. As always, make sure to follow the child and take your kiddos lead! I recently really wanted to get our girl a beginner bike and her gross motor skills indicate she’s ready, but she had absolutely no interest in riding on one. We’ll keep giving her the opportunity to explore with beginner bikes until she’s ready and interested! As regular readers know, I’m passionate about natural material, non-toxic toys whenever possible. One of my favorite toy companies is Hape. Their quality is great and they use non-toxic materials. We own several Hape toys and love them all. Luckily they make a variety of ride on top toys and beginner bikes so we’ll have plenty of options once LG is ready! 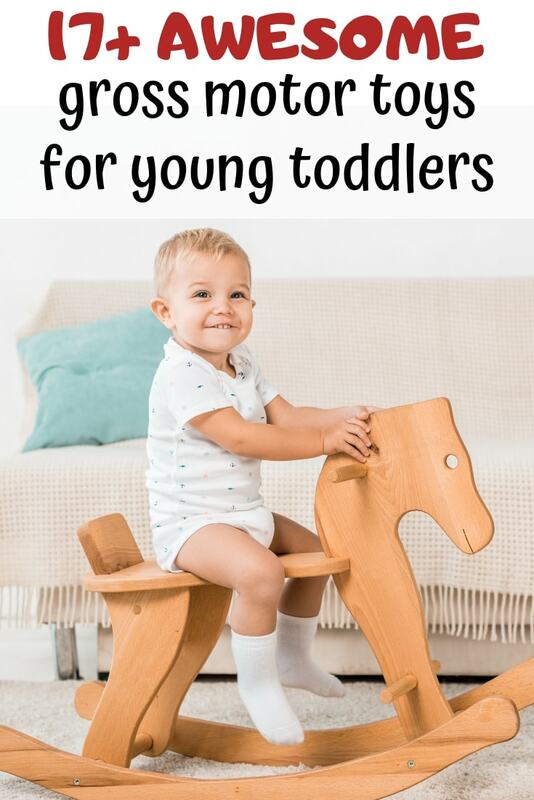 My top pick for young toddlers is the Hape Scoot Around. I’ve checked it out in person and I really like it! It has four wheels for stability, non-toxic, water based paints and finishes (because young toddlers still put things in their mouths! 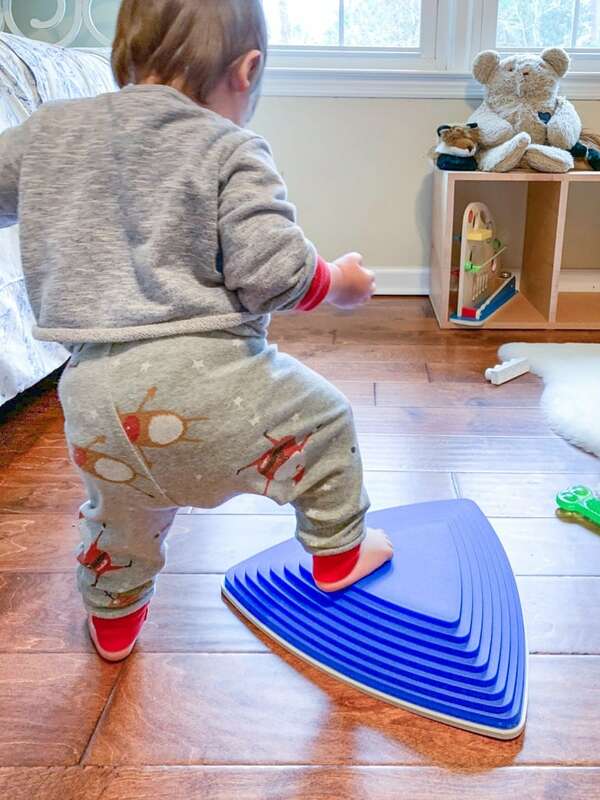 ), and it’s easy for toddlers to use as a walker before they’re ready to really ride. Plus the bright green is cheerful and gender neutral, which makes it hand down to another kiddo later. The Scoot Around is perfect for indoors, but the Hape Kids Trail Rider is a better choice for outdoors. With grippier tires it’s perfect for outside adventures! The Hape Red Wonder Wagon is another sturdy choice for young toddlers. It can be used as a walker, pulled, or even ridden in! It arrives basically assembled, which is nice because who has the time to put together complicated toys? One note of caution – make sure to lock the handle up while your toddler is climbing around on it to help keep them safe. In general, balance bikes are recommended for toddlers 18 months and older. If your little one is large enough and has an interest, a balance bike is an absolutely fantastic gross motor toy that helps with strength, balance, and coordination! The Strider balance bike is a favorite because it’s adjustable for years of use. There are so many fantastic gross motor toys for older toddlers and pre-schoolers, but there are plenty of fun indoor gross motor toys for young toddlers available, too! 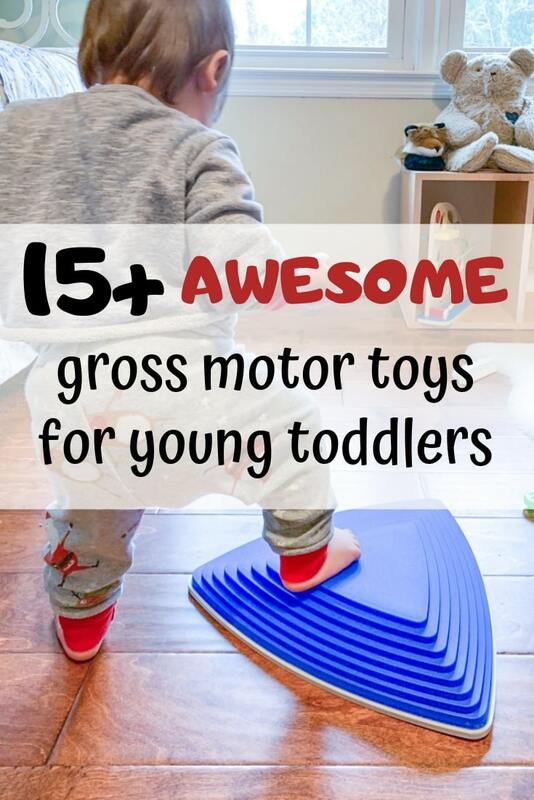 I really hope this list helps you out and please leave a comment with your top gross motor toys for toddlers if I’ve missed anything fun. 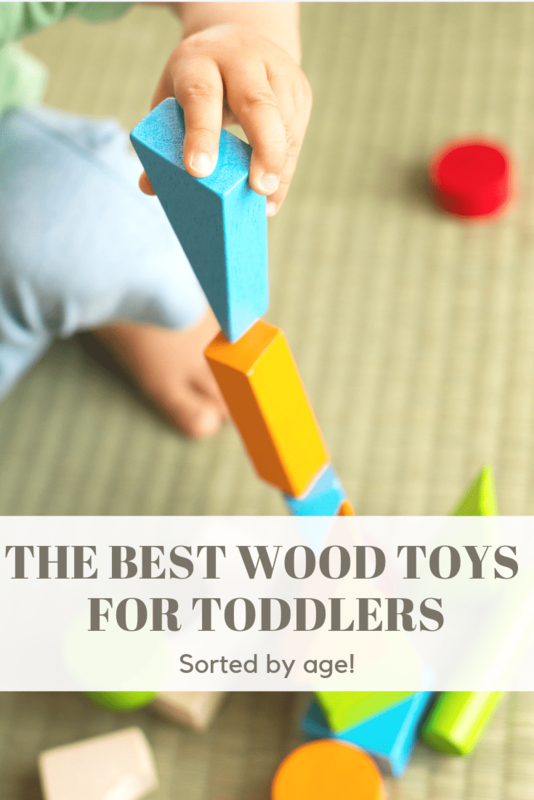 If you have a toddler, you’ll probably also enjoy this collection of the best non-toxic wood toys for toddlers. 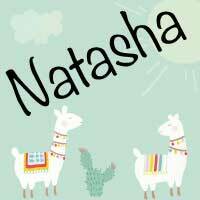 I list my favorite non-toxic wood toy brands and top picks by age!